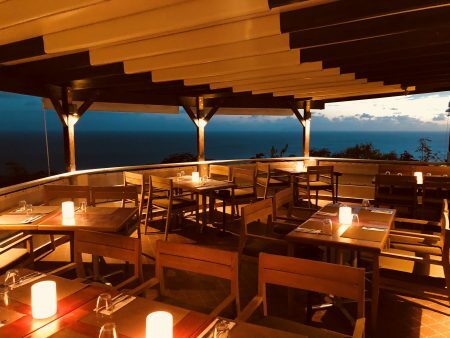 After 11 Months, One of My Most Favorite St. Barth Restaurants Re-Opens! Like so many of you who keep asking me for Post-Irma updates on the reopenings of the restaurants that are so much a part of The St. Barth Experience, I have waited and waited to hear news on one of my most favorite. Well, the time has come! 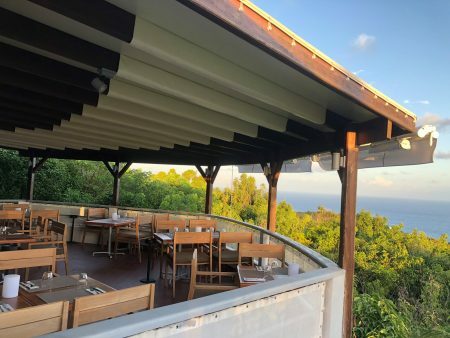 I am so happy to announce that the newly refurbished Santa Fé restaurant reopened on July 29, 2018. I love the entrance and bar area at the Santa Fé. The view at lunch is just as wonderful as ever. The view from the Santa Fé is just as stunning in the evening. September is the quietest month of the year for tourism. The annual closing of most of the restaurants, boutiques and hotels is drawing near. The reason? 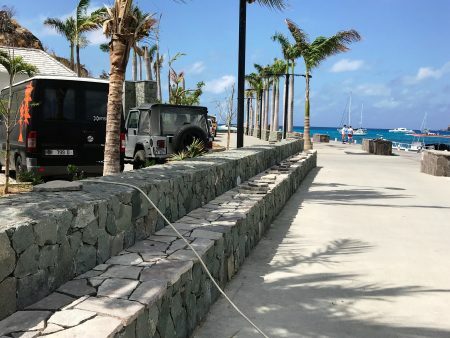 Not only is it the peak period for hurricanes, employees of France (therefore, St. Barth) are automatically guaranteed 5-6 weeks vacation every year, unlike in the US where vacations are usually based on the number of years a person has worked at the company. So, closing for 5-6 weeks works well for enterprises in St. Barth. They take advantage of the time to refresh their establishments. Who on St. Barth does not take these September vacations? The government, some enterprises, including several restaurants and parents with school-age children because the schools in St. Barth reopen the first week in September. 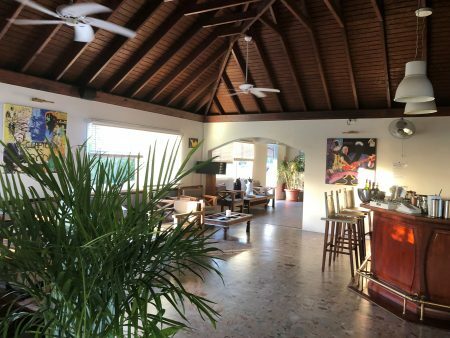 Both of our St. Barth Properties Sotheby’s International Realty sales and rental offices remain open to serve you. Many of our clients love to go to St. Barth during this period because they are seeking quiet relaxation. Although, the majority of restaurants will be closed, the good news is that you can dine at a different place every day. So, if you vacationing on the island during the quiet period, you can still dine at a different restaurant every day if you wish. Bon Appétit! New Restaurant Opens in St. Barth! Plus, Should You Bring Some Cash When You Travel to St. Barth? It has been 6 months since powerful Hurricane Irma struck our little island. St. Barth looks healthy and is thriving. Almost every one of our villas is booked during the month of March. Everyone I bump into goes out of their way to tell me how much better than expected their St. Barth vacation has been. 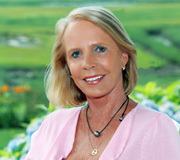 They love seeing how well the island has recovered and cherish the laidback vibe. I still see subtle signs of the recovery. My power walk along the harbor on Saturday brought me by a skilled stone worker replacing stone tiles. The stone tiles are being replaced along the harbor by an expert – just like putting together a jigsaw puzzle. I have been enjoying the view and sunsets from my villa and am still trying out new restaurants. Do you remember Hervé Chovet’s restaurant Le Rivage that was at the St. Barth Beach hotel (the first place we stayed when I came here in 1986) many years ago? Then he opened Côté Port on the harbor? It was scheduled to be closed in favor of dockage on the harbor and Irma did the demolition for the Collectivité. 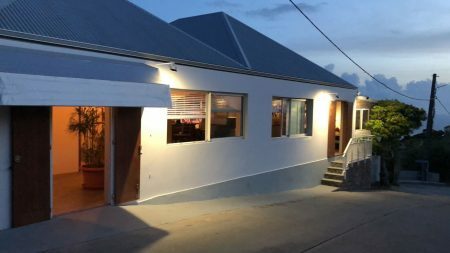 Hervé worked diligently on securing a new spot and opened Quartier Général (Headquarters) diagonally across from the Gustavia post office a few weeks ago. We tried it and loved it! It’s a long narrow venue with comfortable tables and cushioned seating, a long bar and dim lighting (use your flashlight feature on your phone). The menu is varied, and I was happy to see that some signature dishes from the days of Le Rivage are still on there. 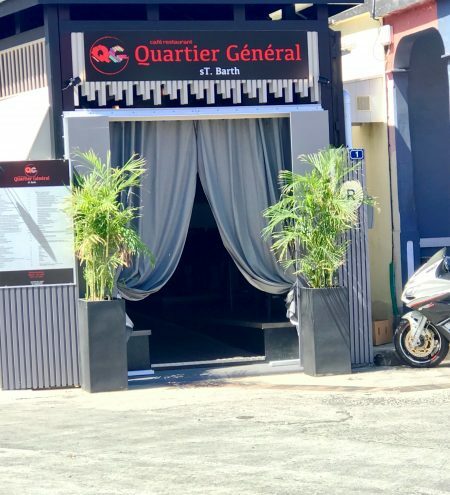 Quartier Général is open for both lunch and dinner. It was very busy. We will be happy to make a reservation for you. I love the curtained entrance to Quartier Général. Quartier Général had a nice ambiance. A bit of sad news: The hotel Christopher was due to reopen on February 22, 2018. Sadly, a fire broke out in their Taïno restaurant’s kitchen 3 nights before the opening. 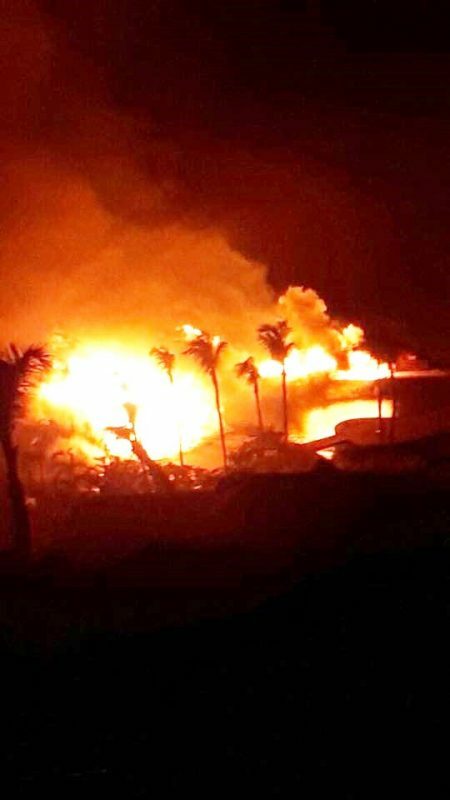 Evidently, electrical wires that had been damaged by hurricane Irma caused the fire and the restaurant was destroyed. The hotel will not reopen until October, so we are in the process of relocating our clients who were booked there. Contact us, reservations@stbarth.com if you would like us to assist you. The hotel is working on opening its Mango restaurant for lunch (no pool, however) and Sisley Spa. Ask our office for more details. A new challenge presented itself Sunday night March 4th, 2018 when the Internet and cell service went down island-wide. Of course, no one knew that it was an island issue until they asked their maid or went out to get their baguette and overheard the local gossip. I drove down to my Gustavia rental office; it was bustling. No one was upset – this is an island, after all. Go with the flow. Miraculously, we had a Wifi connection in the office, so our clients were able to check their emails and we could print their boarding passes. What happened? The huge Nor’easter that wreaked havoc on the east coast of the US, believe it or not, came all the way down to the Caribbean producing huge swells. The result? An underwater cable belonging to the carrier Orange snapped. We had to adjust to the situation. 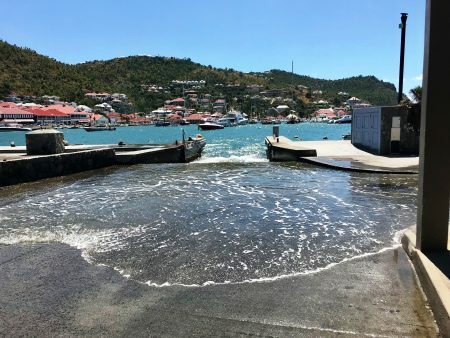 The swell caused flooding in Gustavia. We can really say that this is what St. Barth was like 25 years ago – a time gone by, when we were able to truly take a vacation and enjoy the relaxation without the distraction of sneaking a peek at a device. We wrote our name and the time we wanted to dine on a pad pf paper that was hanging outside of a restaurant. 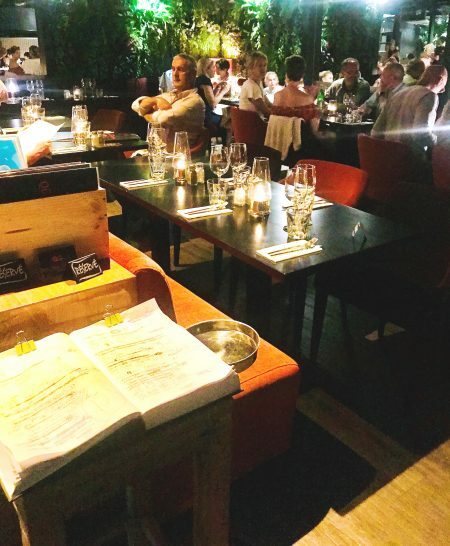 This time, our concierge, Aurélie Janvier physically went to the restaurants to make reservations for our clients. Restaurants cooperated by taking the credit card information manually and would charge the card once the Internet was restored. Carrying some cash while traveling Is always a good Idea. If you want euros, you can go to your local bank or AAA office, if you are a member, and ask for euros. They will give you a decent exchange rate. If not, US dollars are accepted everywhere on St. Barth. Our villas are equipped with a safe where you can store the money. All is well with the Internet now but, remember, that you are not at home and the connection here can be slow. Take the time to disconnect, you will be happy you did. I never get tired of the sunset view from Villa Everest.